The big card show last weekend yielded little in terms of personal pickups for my various collections. While that's not my main priority when going to shows like this, I did find it interesting that there weren't more cards in the numerous monster boxes on the dozens of tables there that would pique my interest. Sure there were a ton of cards there that I would have loved to buy, but I try to go to shows nowadays with a more streamlined approach. My wallet thanks me for that these days. But with all of the recent Linden cards released or insert cards from various sets now in it's initial wave of the open market, I found it surprising that there was little to be had. When the odd time came that there was a Linden card in a showcase....it was just priced to the point that I didn't even bother making an offer. I knew we wouldn't come to any sort of middle ground. One of the nicest insert sets in my opinion (and right up my Stanley Cup alley) reared another offering. 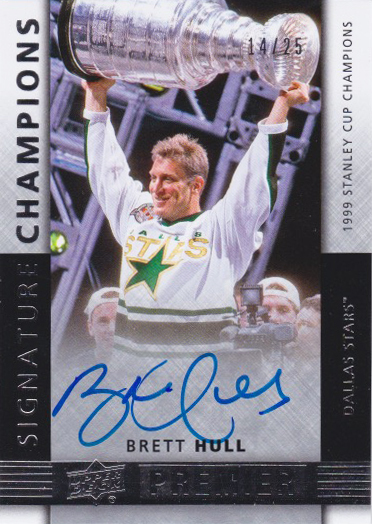 This Brett Hull auto is limited to just 25 copies so finding a realized price on it was not easy. In fact, I couldn't find a quick answer to "how much has this card gone for in the past". So the price that was on it was all I had to go on....and I knew I didn't want to spend that much. I managed to get the seller to budge a bit, but I still felt like I overpaid. I justified it by saying that the price was in Canadian dollars, there would be no shipping costs and I had just won a small chunk of change playing poker the night before. It's like the card was just begging me to buy it. I like the fact that I've now added a card of this print run to my project. I've still got a long ways to go (as I've noticed that Premier has inserted this set for the third year in a row). Lots of cards now to chase. But I'm a patient guy. 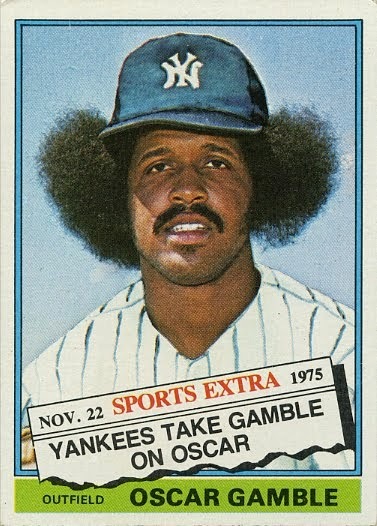 The card show last weekend was proof of that. Great card. Always loved Hull and the fact that he chose to play for Team USA.